KineMINI is upgrade version of KineRAW-MINI. Actually, KineMINI is not so much an upgrade but a whole new model of Kine camera. Built-in Cineform codec, 4K RAW option and HiSpeed Option, SDI output, turns KineMINI into a much more professional cinema camera, not a toy. With such performance, KineMINI keeps nearly same shape and weight with KineRAW-MINI, only increase 10% on length. All accessories used on KineRAW-MINI are suitable for KineMINI. KineMINI defines a new standard on professional Cinema Camera: full function, all in for Cinema, lightweight, solid, and versatile, even for one-man band. KineMINI™ is 444 or 422? bit depth is 12bit? KineMINI™ Records three RAW formats as KineRAW(.krw), CinemaDNG and Cineform RAW mov online. These codecs are very high RAW images; for RAW clips, there is no color sampling at all, equivalent to RGB444. Bit depth of three codecs are 12bits. How about the Latitude of KineMINI? Yes, the Latitude of KineMINI is same with KineRAW-S35: > 13 f-stops at 2K, and 12 f-stops at 4K. How about KineMINI™ Recording resolution? Pure camera body can record 4K? KineMINI Can record high resolution up to 4K@30fps(4096×2160@30fps); But 4K recording is an in-camera OPTION, in another word pure camera body does not have the 4K option. If no 4K RAW option, you can also record 2K/1080p/720p, in-camera with Cineform and CinemaDNG codec. Can use free KineStation to transcode KineRAW(.krw) and CinemaDNG into 4K Cineform RAW mov, RGB444 mov. KineMINI™ camera body can record 1080p@96fps at HiSpeed mode? How about the HiSpeed Option? KineMINI Can record high fps up to 1080p@96fps(1920×1080@96fps); But HiSpeed recording is an in-camera OPTION, in another word pure camera body does not have the HiSpeed option. If no HiSpeed recording option, you can also record 2K/1080p@60fps or 720p@100fps/60fps, at crop mode. For HiSpeed Mode, how about the frame and recording time? For HiSpeed mode, it is captured in S35mm framing, and there is no recording time limitation. What is the recording formats of KineMINI? How about the recording time? Yes. It supports 3K 4:3 Anamorphic with resolution: 2880×2160. Note: It enables 4:3 Anamorphic only if 4K Option purchased. Yes. KineMINI is capable of quick motion capture (undercrank). As of undercrank/Quick-Mo, the lowest fps is down to 6fps under current firmware. You can set any custom sensor fps between lowest and highest fps, the accuracy is 0.001fps, while recording fps is set by project fps in the camera. It provides much more possibilities over fixed fps like 24, 25, 30fps. KineMINI™ suffers from Rolling Effect? How does it compare to DSLR Camera? 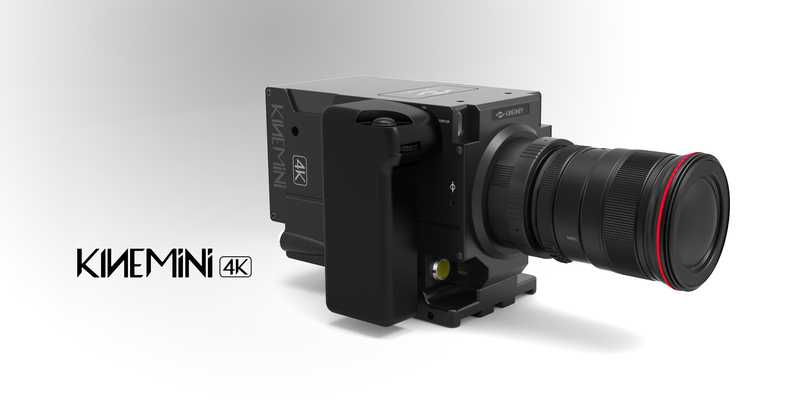 KineMINI employs a state-of-art 4K S35mm CMOS sensor. It does suffer from some rolling effect. But it shows less rolling effect compared to DSLR cameras. If you want to take action shots, KineMINI features sport mode which reduces rolling effect greatly, seems like global shutter. Sport Mode is designed to alleviate the rolling greatly, and make KineMINI handle quick movement shootings, like handheld, shots on shoulder, documentary style. The footages would be turned into Cineform RGB444 mov after KineStation transcoding. Note: Sport Mode takes effect only on 2K and 1080p, not 4K. And Sport Mode refers to HiSpeed Mode @30fps or below. KineMINI™ image sensor is full-frame? How about the conversion ratio if use DSLR camera lens? 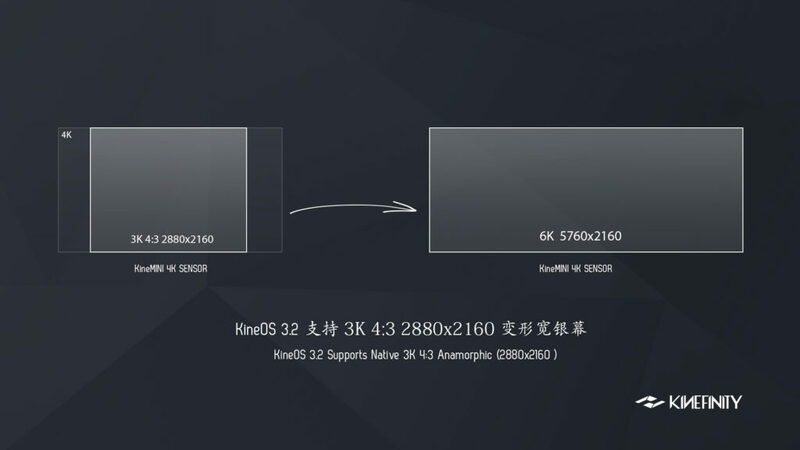 It is a S35 frame size, same with KineRAW-S35, like most mainstream S35 Cinema cameras. Its active frame size is close to APS-C, so its conversion ratio is close to APS-C camera too. What's the frame size at 720p, 1080p or 2K? It is only Crop mode? Kine cameras have two working modes for different resolutions creatively. Cropping, means M4/3 3K recording, or S16mm framing, there also are 2K/1080p/720p; in this case, 720p@S16mm mode, is cropped from 2K@S35mm. How about monitoring on KineMINI™? Is there SDI port? KineMINI features two high definition display ports with industry standard: 1080p or 720p: you can set the monitoring resolution in-camera. Yes, there is SDI monitoring output option. One SDI and two HD display ports can provide three monitoring paths and meet the demands for EVF, field monitor, and DP monitor without need any other splitter nor converters. What mount does KineMINI™ have? It supports electronic EF lens? What is KineMOUNT™? Native Active EF, supports in-camera Iris control over majority of EF/EF-S lens; display Iris number and tune Iris number electronically. And even B4, OCT-19 mount. Note：EF mounting adapter support Iris control, while Nikon F mounting adapter not. Besides, mounting adapters are independent accessories, not included in machine body. How about the new lock-style EF mount? Whole new lock-type EF mount, new lock-type EF mounting adapter, new lock-type Nikon F mounting adapter from 2014 Jan. Its fixing way is very similar to Cine PL mount: lock ring rotation, not lens rotation to make sure EF lens locked firmly and to be contacted well with pogo-pin contact inside of EF mount in any case. Compared to traditional lock way based on spring metal, the new EF mount gains much better stability; fits very well in professional way when video shots using follow-focus gear. If chose machine body with native EF mount, can I replace it with KineMOUNT later? Yes, with extra cost as US$499. KineMINI™ can playback? The color is only LOG when playback? It CAN playback based on your project fps setting, typically it runs as 25fps. Color shown when playback is based on LUT you chosen: LOG or Rec709, or KineColor. Generally, it records in LUT of REC709. How does KineMINI™ record audio? KineMINI supports MIC-IN, but not MIC with phantom 48V. It will generate two independent uncompressed wave files. Now it is mono, not stereo. If record format as Cineform RAW mov, KineMINI will embed the audio track into mov file only if project fps equals to sensor fps. KineMINI™ has fan? How about the fan noise? Yes, it has fan inside. KineMINI has in-camera fan to cool the camera itself and make camera work well in stable condition. Fan generates noise. You can choose Record Stop in Fan setting to make FAN stop works temporarily: Fan works when live view; Stops when recording begins so that it is totally quiet when recording. It is very important in quiet environment, and sensitive to any audible noise. DSLR rigs can be used on KineMINI? As long as general accessories with 15mm rod, they could work with KineMINI probably, like Matt-box, follow-focus, etc. Handhold: you could use small off-the-shelf battery as 18650 Li+ battery with protection if you purchase the KineGrip. KineGrip is a combination of battery holder and controller; Every time you need to use three 18650 batteries at the same time, and batteries can be changed quickly if they are drained. One triplet 18650 batteries (3400mA panasonic) can sustain around 60~90 mins for KineMINI. Caution: Must use 18650 batteries with protection circuits. Batteries without protected are prohibited to be used for KineMINI. Caution: Try to use genuine panasonic 3400mA/Sanyo 2600mA batteries with 3MOS protection circuits. Caution: Always use Three batteries at the same time, Charge them at the same time. Studio, Use external broadcasting battery like V-mount SONY battery to power KineMINI by a Kine Power cord. KineMINI has a push-pull port with 2-PIN, wide voltage range input, from 6V~18V. For a 14.4V broadcasting battery with 130Wh, it can power KineMINI SIX hours. Also there is Kine AC-DC adapter to power KineMINI directly. Steadicam, KineMINI can be powered directly from Movcam Steadicam by a special power cable. Customized, Even you could DIY a power cable to power KineMINI based our power cord with open ended. What kind of batteries which KineGrip can use for KineMINI 4K? How long does it sustain for normal usage? The great thing of KineGrip for KineMINI™ 4K can use industry standard 18650 batteries. KineGrip with New Battery Holder must use three 18650 batteries with protection one time. Battery holder can be easily operated for batteries replacement. New KineMINI can work up to 90 mins if using new Panasonic 18650 batteries with 3400mA capacity. Never rip off the thin film around the 18650 batteries: these film are to solid the protection circuits with batteries. Do Not charge batteries with large current: avoid charging current over 1A. Recommend NiteCore I4 charger from Kinefinity Store. It takes around 4~6 hrs if charging a 3400mA battery to full state. How to buy 18650 battery with 3MOS protection circuits? Alway buy and use them in triplet, Recommend purchase link: Powerfocus batteries triplet (in Tmall). Note: we did some tests on the two type batteries, but there is no promise that their batteries can always meet the spec. I can buy more battery holders for new MINI? Yes, you can buy 18650 battery holder separately, with three colour options: White/Blue/Red. Battery holder is printed with 3D tech. What kind of in-camera options? In-camera options, means they are built-in before shipment. You need to return camera body to Kinefinity for later purchase. It may take 3~5 working days for it. 4K Recording Option: KineMINI Can record uncompressed 4K RAW CinemaDNG and compressed lossless DNG too. You can use the DNG directly, or employ free KineStation to transcode DNG into 4K Cineform RAW mov, RGB444 mov, 4K ProRes422HQ mov. It does not need to return Camera back to factory to upgrade the option so that you can purchase it and upgrade it after you bought camera. HiSpeed Option: is a special mode for sensor capturing high speed objects. Its codec is same with sport mode as compressed lossless RAW sequence named as KNG by Kinefinity. It can capture 1080p slow motion up to 100fps, and no recording time limit till your KineMAG full. 3G SDI Monitoring Option: supports SDI monitoring output for broadcasting monitors, the resolution is same as HD display output as 1080p or 720p. 3D SYNC Option: KineMINI can take real 3D shots. Just one SYNC cable to connect two KineMINI SYNC port, set up Master and Slave instantly. 3D SYNC means: Scan sync, frame sync and time code sync, less than 5uS of mismatch! WIFI Control Option: Control camera by wifi control app (KineRemote) on iPad now. Download App directly from Apple App Store. KineMINI™ can use other brand SSD? Is there any recommendation list? Kine cameras do not prohibit users from using third-party SSD. Users could try to use third-party SSD, but generally speaking, third-party SSD are consumer-type, often using MLC flash memory chip even TLC memory chip. As known, MLC and TLC suffers from stability and much lower durance, compared to SLC Flash. KineMAG employs high quality SLC flash memory chip. Only KineMAG SSD is recommended. Note: Performance on data spec are guarantied by KineMAG SSD. There is no technical support or help on recording issues such as frame drop or data loss if using third-party SSD. KineMINI™ has EVF or monitors on camera? The camera body itself does not have EVF nor LCD Monitor, but you can choose to buy any EVF or LCD from one hundred USD to thousand USD based on your budget. Alphatron EVF (iPhone Retina LCD, HDMI&SDI) and Cineroid EVF4C (480p, HDMI) are recommended. What can KineGrip do? besides powering KineMINI with interchangeable battery? KineGrip provides not only power to KineMINI, but also provides full control. The battery inside of handgrip is changeable, and provides around 60~90 minutes of powering KineMINI. KineMINI can switch handgrip battery and external power like broadcast battery or DC IN, smoothly and hot-swap, like UPS. The dials and buttons on KineGrip can control Iris (if EF lens), ISO directly, and other camera parameters. What kind of Steadicam for KineMINI™? Typically, Knight D100 From Movcam is OK.
What does KineKIT include? Including Matt-box or Follow-focus? KineKIT is designed, made specifically for KineMINI by Movcam. It is a basic KIT, that means do NOT including Matt-box nor Follow-Focus. It features lightweight and robustness, and is compatible with any accessories with 15mm rod system. Here, we just address Cineform RAW mov and CinemaDNG sequence briefly. You can get more information on post workflow on Cineform RAW/RGB444 and post workflow CinemaDNG in separate tech notes. Since KineStation can transcode KineRAW(.krw) and CinemaDNG into Cineform mov (top intermediate codec in film industry), we strongly suggest Cineform as codec of post workflow(CinemaDNG can be also transcoded into Cineform mov by KineStation). So for the following introduction, we address Cineform as post-workflow, mainly. What about the workflow of KRW codec? NLW or DI software can work on it? KineRAW (.krw) codec, cinema-level codec is developed by Kinefinity with great efforts and resources. Its average compression level is 3:1, lossless compression algorithm: it remains whole information of original image, there is no color sampling and loss. The 240GB KineMAG SSD could record around 45 minutes 4K RAW clips with its date rate close to ProRes422HQ. KineRAW(.krw)codec may be supported by NLE or DI software directly in the future, with the increase of more Kine cameras. KRW can be transcoded into following industry level codec(KineStation V0.7): Cineform codec and CinemaDNG codec. What's the KineStation? KineStation is free for Kine owners? KineStation + KineCamera = Kine Hybrid System (KHS) . Kine Hybrid System (KHS) is designed to make frontend capturing and backend processing for high-efficiency post workflow. Kine Cameras as frontend capturing tool as RAW to remain Maximum details and latitude, and KineStation as backend bridge running on PC or MAC to post workflow. KineStation can transcoding KineRAW and CinemaDNG into Cineform RAW and Cineform RGB444 with debayer options for different controls from RAW into RGB domain to match your favourite workflow. To get to know more information of KineStation, take a look on FAQ of KineStation. What's Cineform RAW mov? Compatibility with mainstream NLE and DI software? Cineform codec is cross-platform: run on both MAC and Windows smoothly and efficiently. Nearly all commercial editing tools like Final Cut Pro™, Premiere™, Eduis™, Avid™ and Vegas™, etc, and nearly all grading software like Firstlight™, Speedgrade™, Resolve™, Scratch™, After Effect™ etc. support Cineform very well, except the Color™ which does not support 3rd-party codec. Workflow base on Cineform can not be simpler: Shoot, Edit and Grade directly on footages, realtime, no need proxy for 2K. Yes. Just need to install Cineform Studio as Cineform decoder plugin. To process Cineform RAW files, do I have to buy expensive computer? Cineform codec is so efficient that lap-top with mainstream configuration can edit and do primary grading 2K Cineform smoothly; does not need proxy file, and some special graphic cards too. But for 4K or higher Cineform, you need a powerful workstation, like new MAC Pro. For rendering purpose, you always need power computer to speed up rendering, no matter what codecs. What kind of software do I have to install to process Cineform RAW? Recommend: GoPro Cineform Studio (free) + Quicktime7 on Windows. Check more Related softwares: Learn more about related-software. What is CinemaDNG? It can be playback directly? CinemaDNG is uncompressed RAW format, frame-based, just like Film. In terms of motion pictures, it is a frame sequence of 24 uncompressed 2K RAW images if recording 2K @24fps by KineMINI. Adobe software including AE, Speedgrade, and other DI software like Davinci Resolve can grade CinemaDNG natively, and latest Premiere CC, Resolve can edit CinemaDNG sequences. There is no color sampling over CinemaDNG at all. It holds native whole range of sensor output and so remains maximum room for grading work. What is file format of KineMAG™ SSD? How to format it, read clips from KineMAG SSD? KineMAG SSD employs HFS as file system. HFS is native file system for MAC OS. Always format SSD in-camera, not on a MAC computer. For reading clips from KineMAG SSD, there is no any obstacles on MAC OS; but you may have to install HFS+ or Macdrive, or other system plugin in Windows. Hardware level, you may use any SATA to USB 3.0 cable to connect KineMAG SSD to your computers. Premium 4K Delivery, Theatre Movie, iMAX. More Integrated Interfaces. Covering 720p/1080p/2K/3K/4K, Premium 2K Delivery，2K Slow-Mo. Lightweight, small for tight space. You can configure your KineMINI based on your current Lens, Accessories, monitors and Budget, because KineMINI adapts general display ports, wide range input voltage, and mounting options. For the color of camera body, you could choose Black or Titanium Grey. Attention, The exterior color of mount is black or steel anyway. For the choice of mount, it depends on your lens resources and consideration of future usage. Body with KineMOUNT: can be regarded as omni-mount system. If you have EF lens, and PL mount lens, or may rent PL mount lens in future, your best choice is to buy body of KineMOUNT. KineRAW-MINI with PL mount may be most economical PL cinema camera so far. If you have OCT-19 lens, need to buy OCT-19 mounting adapter (K2OCT19). Every mounting adapter or mount from Kinefinity is all lock-type mount, like cinema PL mounting lock way. It provides much better stability; fits very well in professional way when video shots using follow-focus gear. This entry was posted in Downloads, FAQ and tagged Cineform, Cineform, CinemaDNG, CinemaDNG, KineRAW-MINI.